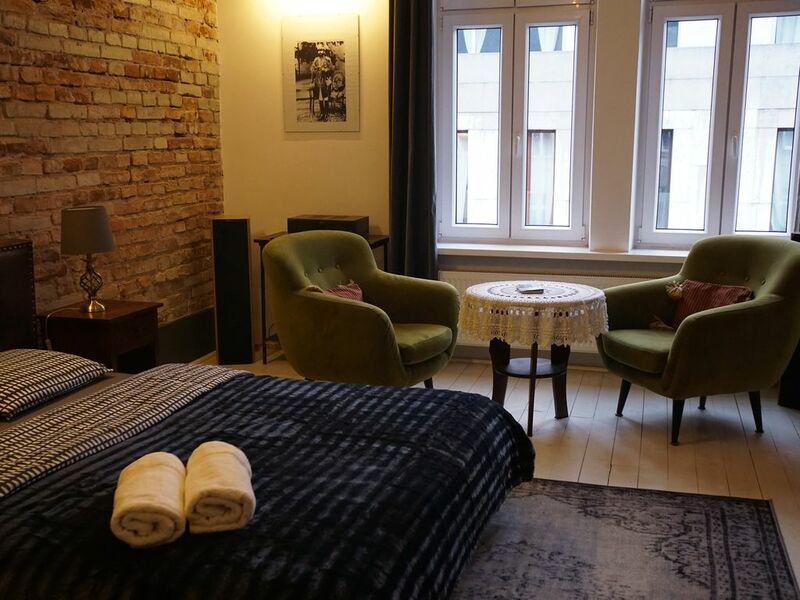 The newly renovated apartment is located in one of the most charming places in Cracow - former jewish quarter which is very popular among fans of monuments and history as well as nightlife. Owing to the variety of restaurants, pubs, cafes, galleries. Stylish high ceiling apartment in the building dated on 1910, situated in one of the most popular street in Kazimierz district Miodowa. Everything within a walking distance. Apartment is on the third floor. Front view on the main street (Miodowa). There is no elevator in the building. In the apartment there is a king size bed in a bedroom and also sofa/corner settee which can be converted to a double bed (on the pictures). There is a bathroom with rainshower. I can give tips about best restaurants, beer gardens and clubs but also can help with arranging tickets to the opera, teather, filharmony or other events. I can give a litlle sightseeing tour in a free time or share a drink if the guest wish. As the area is very lively is not recomended to the people who are bothered with some noise and as it is third floor for the people who needs the elevator to get in. The place is perfect for couples who want to spend time in atmospheric place feeling magic of bohemian district and be walking distance from most important historic and cultural spots. Could not fault at all. Brilliant apartment with a fantastic and quirky design. The location was superb and central to everything good. This apartment is amazing. Its very stylish and comfortable, we felt right at home. The shower is big and has plenty of hot water and great water pressure. The bed was one of the most comfortable that I've slept on in Europe. The location of this apartment can't be beat. Just across the street is a Polish restaurant that we actually ate at twice during our stay. Down the street and just a block over is a bunch of restaurants, bars and street food. Old town is less than a mile walk and there is tons of shopping. Wojtek was also great with communication. We got in at 6 AM and check in isn't until 3 but Wojtek messaged me at 12:30 that the apartment was ready. He didn't have to rush to get us in but he did and it was very appreciated! I would love to stay here again and I would absolutely recommend staying here to anyone who is looking for a great place in Krakow. A unique apartment in the center of Kazimierz, facing Miodowa. No traffic or pedestrian noise, and relaxing to return to after a day of sightseeing or an evening in one of the many restaurants. Great place and location. Highly recommend. Excellent stay in clean, spacious and centrally located apartment. Host was very helpful in meeting us and giving suggestions on things to do, best restaurants and shopping in area, etc. We also arranged through him day-trip from Krakov to see historic salt mine, as well as transport to airport. He was attenyive to all our interests and his apartment was a real home away trom home . A most enjoyable stay. Our time in Krakow and Kasimierz was exciting, interesting and fun. This week was made even more perfect by our selection of this superb property. It has everything - perfect location for seeing all sites and easy access to public transportation for sites that are further away; world-class restaurants at your doorstep; a comfortable one-bedroom apartment with every amenity; and an owner who is responsive immediately to provide a tour connection, answer a question or arrange for an airport transfer. We cannot wait to be back.